Chicken, chorizo, and rice; such a delicious combination, made even better with the addition of red wine and chicken soup. Normally, with chicken, recipes use a dry white wine, but I decided to use red instead, and it tasted SO good. Easy to make, this is an excellent family meal, and although I ate it on its own, it would also go well with vegetables. Preheat the oven to 180° or 160° fan forced. Bring the stock to the boil. Meanwhile, while this is coming to the boil, use a fat-free wok or large oven-proof dish over high heat, and add the chorizo. Cook until it is browned all over. Remove and cover to keep warm. Discard all but 1 tbsp of fat from the pan. Add the diced chicken thighs and cook, stirring, until the chicken is browned all over. If need be, add a bit of oil to pan, and cook the onion and garlic until soft. Add the capsicum. Cook, stirring for about a minute. Add the rice and paprika, and stir to coat. Add the wine, simmer uncovered until the liquid has evaporated. Add the hot stock and return the chicken. 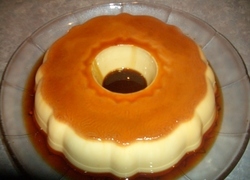 Cover and bake in the oven for about 25 minutes, or until the liquid is absorbed and the Arborio is tender. Return the chorizo to the pan, and stir until it is heated through. Sprinkle with parsley and grate some parmesan on top, if required - this DOES give it a nice flavour. Also good to heat up again in the microwave on another day. Do you like egg custard, and have you ever made your own? 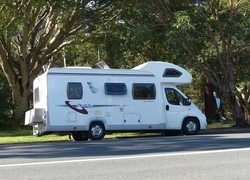 Would you like to own a motor home?